Posted in Status on March 31, 2016 by erik.rasmussen@noaa.gov. Busy day. I wish I could write a cogent description of how things evolved in the VORTEX-SE domain today, but I really am unable! As with our other deployments, I would have been unable to forecast any of the evolution I observed beyond perhaps 30 minutes. And that may be giving me too much credit! There were a series of supercells that moved along the TN/AL state line in the northern part of our Doppler area. 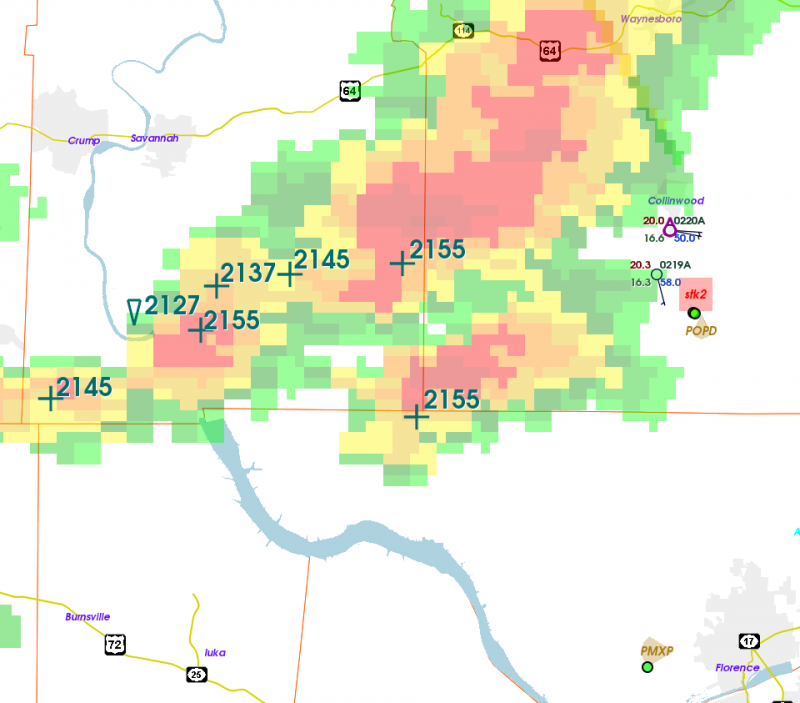 We were able to deploy sticknets and disdrometers ahead of one of these early in its life cycle, and one of our teams reported a wall cloud, and another a clear slot. These storms intensified as they continued to move east, but we haven’t received any reports of serious tornadoes with these despite fairly strong and persistent mesocyclones. After sunset, a blast of cells formed in MS and moved across our domain. This evolved into the form of a big bowed line of cells, and along the “bent-back” portion of this line we saw a number of areas of low-level shear. One of these developed into what was probably a significant tornado northeast of Hartselle AL, southwest of Huntsville. This was in one of our dual-Doppler lobes. We don’t yet know how significant this tornado was, but it had a prominent debris signature on dual-polarization Dopplers. 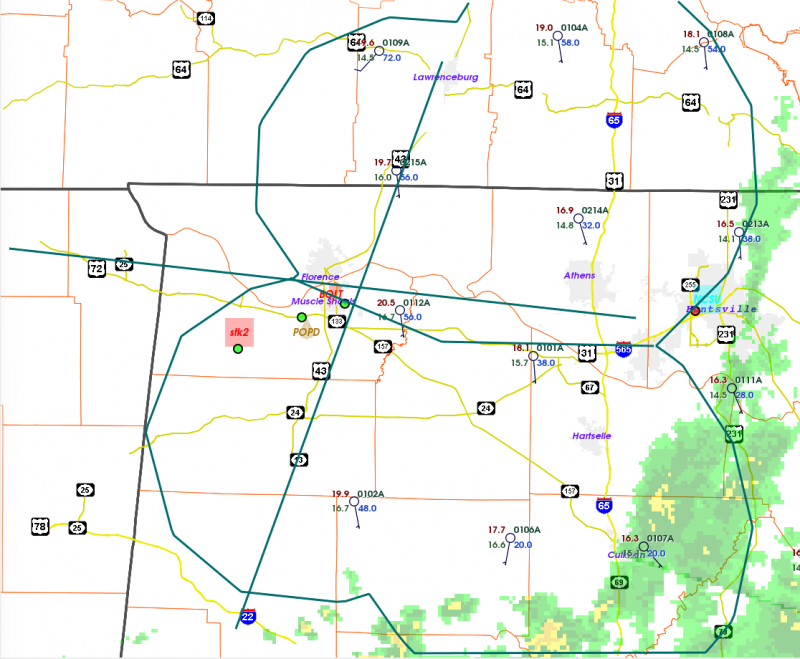 It was a tense ~hour for the UAH people at SWIRLL as this vortex moved toward Huntsville. A couple of other of these low-level shears were well-sampled in our southwest dual-Doppler lobe; they were non-tornadic as far as we know. Two or three tornadic supercells also occurred south of the bowing line of cells, but these were south of our observing domain. So this was a good IOP… well observed from the perspective of dual-Doppler, soundings, and stesonet, and not surprisingly very difficult to observe with the fully mobile assets. The scientists and teams have been working for 13 hours, and there are a lot of signs that the low-level shear is now not favorable for additional tornadoes. So operations are being wound down. Right now we are focusing on some storms just across the state line in southern Tennessee. These have had some pretty persistent, but modest, low-level rotation. Surface conditions near them are fairly cool and stable. But we are looking at these storms until something more potent moves in later this evening. The annotated “+” are locations of low-level shear on WSR-88D over the last half hour. You can see the STK2 team deploying sticknet weather stations ahead of these cells. We are still watching cells slowly intensify to the west of the domain in Mississippi. If you are interested in seeing some of the soundings being obtained by VORTEX-SE, they are being shared in a folder on Google drive. Things might be getting pretty busy pretty soon. Thunderstorms are forming over north-central MS and moving rapidly toward the east-northeast. Several of these already exhibit weak shear. It looks like we are ready to collect data. These storms are moving into a band of fairly strong temperature contrast. This would normally favor low-level rotation and possible tornadoes, but at some point they move into air too cool to support them. Studying these sorts of environmental effects are a big reason for VORTEX-SE. 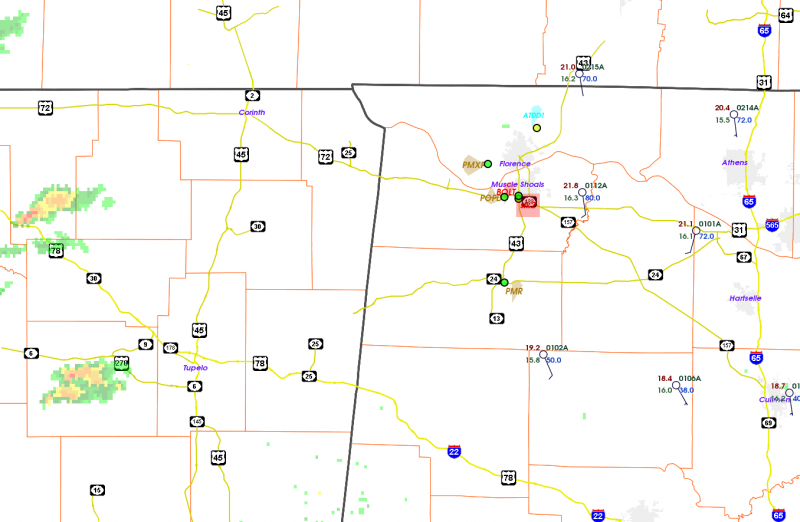 The domain shown here is northwest Alabama and far southern Tennessee and NE Mississippi. Huntsville AL is in the middle-right part of the figure. A few showers linger to the south and east of the domain, but the weather is currently tranquil across the study area. In this graphic, the two lines crossing near Florence AL are a north-south array of sounding systems that will launch soundings about once per hour from five sites, and an east-west array of three systems. This should help us study the rapid return of warm, humid air from the south as the current convective system departs. There are four overlapping circles within which we will have dual-Doppler coverage. The smaller two areas in the west part of the domain are covered by a combination of the UAH MAX X-band mobile dual-polarization radar, and the Purdue/UMASS XPOL radar. Their “baseline” is the short line segment extending from the WNW to the ESE in the northwest part of the domain. The two larger areas in the east part are covered by the combination of MAX and UAH ARMOR C-band radar, with a nearly east-west baseline illustrated. The surface observations that are seen in this figure are the Texas Tech “Stesonet”… 16 sticknet instruments deployed in a mesonet that is collecting data 24/7 throughout our 2-month campaign. An additional set of Sticknets is in a mobile vehicle that is now sitting out toward the MS border, awaiting a clearer idea of where the most significant storms will pass. Similarly, the deployable disdrometer instruments from Purdue are sitting stationary and awaiting storms. The MAX radar began collecting data about 20 min ago, and the Purdue/UMASS radar will commence data collection shortly. This experiment has been designed around the general idea that an old outflow boundary from this morning’s convection will possibly lift northeast toward, or even across, the domain during the afternoon, with an attendant increase in low-level shear and possibly convective initiation. Later, toward sunset or shortly thereafter, storms are expected to move eastward into the domain. The structure of this system remains to be seen… it could be anything from supercells to a QLCS (quasi-linear convective system), to a band with embedded supercell structures. The investigators are currently meeting to develop today’s science plan. Because of the typical constraints of observing in this region (fast storm motion, limited radar deployment sites, etc.) it won’t be possible to adjust the radar deployment when we see the storms approach or develop. Some of the more nimble assets, such as sticknets, disdrometers, etc. will likely be held near the center of the deployment domain and try to deploy ahead of the most interesting activity when it develops. There will be another status post shortly describing the overall weather scenario and the deployment plan. Posted in Status on March 30, 2016 by erik.rasmussen@noaa.gov. The observations in this IOP will commence Thursday morning immediately after the passage of an expected round of morning convection. This morning round is expected to be marginally severe at most, owing to a complete lack of low-level CAPE. Thereafter, the atmosphere is expected to destabilize rapidly, with moderate low-level shear and strong deep shear supportive of supercells. Afternoon supercells are possible in the VORTEX-SE domain, especially after 2 PM. Severe storm activity is expected to increase in the evening as low-level flow accelerates and CAPE is maintained, and persist through part or much of the night. The main window for VORTEX-SE observations is expected to be 2 PM – 2 AM for storm studies, and earlier (perhaps 10 AM to 10 PM) for environment evolution studies. The likely focus will be NW AL, centered toward the Courtland/Florence region. A morning science planning meeting, and short briefing, will be held at UAH SWIRLL at 9 AM. Deployments will occur sometime after that planning meeting. All participants are encouraged to get as much rest as possible on Wed night because of the expected long duration and nighttime observations. Media: try to attend the 9 AM planning meeting where you can meet and discuss your opportunities with the scientists. Beyond this IOP… we did not discuss the long range in today’s briefing, but will resume that discussion at a future briefing. Be aware that we are likely to have another “hard down” period with no briefings for a few days after this IOP unless the weather dictates otherwise. Watch this blog for later information. Posted in Status on March 29, 2016 by erik.rasmussen@noaa.gov. This IOP will commence at the earliest on Wednesday night, but more likely on Thursday morning. The science planning meeting will be scheduled during the Wed 30 March daily briefing, and might occur on Wed evening, but more likely on Thur morning. The overall scenario is one of several rounds of convection between Thur morning and late night/early morning Friday. The first round should be “elevated” with the primary threat being heavy rain. There may be another round or two during the day on Thursday, based on recent experience. Several models are showing a buildup of surface-based CAPE Thursday afternoon, with varying degrees of low-level shear, and strong deep shear. Finally, a cold front passes on Thursday night with an additional round of convection. There is much uncertainty in this forecast, almost all related to the effects of hard-to-forecast convection on the state of the atmosphere. The PIs had a long discussion about this uncertainty, and whether this IOP should be terminated. However, we have a general philosophy that once an IOP is declared, we will terminate it only if there are obvious reasons that it will be a null event. Without this approach, traveling investigators would likely be in the frequent situation of starting travel and then returning home, canceling reservations, etc. After this IOP, current forecast model runs indicate a generally quiet and dry pattern for the first ~10 days of April. Posted in Status on March 28, 2016 by erik.rasmussen@noaa.gov. We have decided to have an IOP on Thur Mar 31. Based on current guidance, operations would commence around sunrise. The system we are watching is forecast to have two phases… an early phase on Thur morning with very strong low-level shear but surface-based CAPE likely not present (but with considerable rain and thunderstorms feeding on potentially buoyant air aloft), and an afternoon-evening phase with a buildup of surface-based CAPE to > 1000 J/kg, but a steadily weakening low-level wind profile. These model details are uncertain, so the investigators have opted to declare an IOP. There is a chance that if the forecast becomes negative tomorrow, the IOP will be canceled at the 1 PM briefing. Beyond this week’s event, there are no signs of significant severe weather potential in the first third of April. Posted in Status on March 26, 2016 by erik.rasmussen@noaa.gov. VORTEX-SE is down until Mon 28 March. Mid-day briefings will resume on that date.